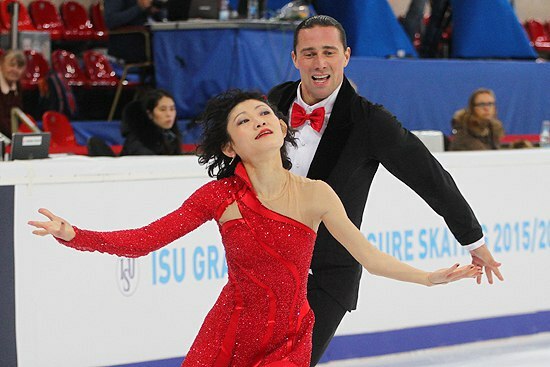 Yuko Kavaguti / Alexander Smirnov have returned to the trainings on ice. Yuko and Alexander told about this wonderful news in interview. Yuko how do you feel now? Alexander: We are already work fully in the gym. The second week have gone. Trying something on ice. Not everything we can do yet, but we don’t give up. So, Tamara Nikolaevna (Moskvina) has an optimistic mood? Alexander: We try not to be discouraged. We also have already identified some training camps, will prepare for the season. Did you manage to analyze why Yuko got an injury and as a result, such an unfortunate end of the season? Alexander: It’s quite inexplicably. Maybe just fatigue of the body, maybe a bad luck. We started season very well, all competitions were going incrementally, nothing forebode troubles. We hoped to compete at Europeans, Worlds. That didn’t happen, but we don’t give up, we still have a desire to perform. May we talk about new programs? Alexander: So far, the main thing – it’s to recover. Again, we have a lot of experience, we can make some small changes, perhaps even can keep programs or to take some old we have a lot of baggage. I repeat: the main thing – fully recover. Do you already had a vacation or it will be soon? Alexander: We’ll have a little vacation. Yuko will go home. But generally we will rest a little, because we already had a forced rest. Alexander: Yuko from the first day immediately began to recover. I have just arrived to the hospital, brought oranges, and she have already printed the plan of her recovery (smiles). I helped Tamara a little with foreign skaters as a coach. Alexander: To be honest, I liked it. How do you think, will this experience help you as an athlete? This year, is a tenth anniversary of your pair. Will you somehow celebrate it? Alexander: Our fans want to attend training. We are planning to invite them when we’ll be able to show something good and decent. I know that even people from other cities want to come to St. Petersburg. Have skaters some problems with training ice because of World hockey championships held in St. Petersburg? Alexander: There are some difficulties. Yuko and I experienced it too. It happens that during the week we change the rinks. How do you deal with difficulties when you go on ice? Alexander: Each competition is unique. Whether it’s a small competition or European, World Championships, Olympic Games. At the Olympics we made a very cunning move: made a program to “Swan Lake”. When I left, my hands were shaking and everyone thought that I was waving my wings. It’s of course a joke. You need to try to compete more often, when you skate at training imagine that you skate at competition. The more you experience these feelings the faster you will learn self-control. At what age did you start training? Can you name the best features of your partner? Alexander: Apart from the fact that Yuko is beautiful and modest, she’s incredibly hard-working person. I’m of course also not lazy, but I can’t train and study so much. Yuko has three degrees. She has stunning performance and a desire to learn new things. She’s also a polyglot: know Japanese, English, Russian and even study French. Who are you by education? Yuko: The first – “International Relations”, second – “the economy”, third – “coach”. Would you like to be a coach? Yuko: I have no desire to become a coach yet, but I liked to work with children. But I still want to skate myself.